Hoefer, Hans Johannes. Wildlife in India (Insight guides). Adams, Ansel. Yosemite and the Range of Light. Goldstein, Milton. The Magnificent West: Yosemite. From The Night the Mountain Fell to Yosemite and The Range Of Light, from	The Magnificent West to Etchings Of Yosemite, Words Of John Muir, we can help you find the parks books you are looking for. As the world's largest independent marketplace for new, used and rare books, you always get the best in service and value when you buy from Biblio.com, and all of your purchases are backed by our return guarantee. New York Graphic Society/Little Brown 1979, First edition/Second Printing (stated), oblong quarto, 116 photographs. Published on the occasion of the exhibition "Ansel Adams and the West" held September 8 to October 28, 1979. Condition: Very Good in wrappers. Very light creasing on the bottom of the front cover. Unmarked. "For sixty years, Ansel Adams photographed among the great peaks of Yosemite National Park and the High Sierra range - the range of light. Inspired by their grandeur, their wildness, and their primeval mystery, he made photographs that were to become the icons, the symbols, of America's national park ethic." Missoula, Mont. : the Author, 1962. Second Edition. Fine copy in the original stiff-card wrappers. Particularly and surprisingly well-preserved; tight, bright, clean and especially sharp-cornered. With very minor water damage; 8vo 8"" - 9"" tall; 88 pages; Description: 88 p. : ill. ; 23 cm. Subjects: Earthquakes --Montana --Yellowstone National Park. New York: Putnam Publishing Group. As New in As New dust jacket. 2004. First Edition; First Printing; Signed by Author. Hardcover. 0399151443 . 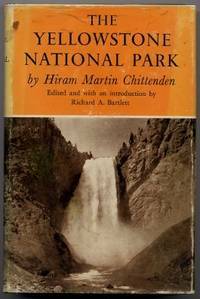 A very beautiful stated first edition/first printing in unread As New/As New condition, SIGNED by author Nevada Barr on the title page; It's fall in Yosemite National Park's historic Ahwahnee Hotel. Four young people, all seasonal park employees, have disappeared. Needing an out-of-park ranger to work undercover, Anna is detailed to dining-room duty; but after a week of waiting tables, she knows the missing employees are only the first indications of a sickness threatening the park. What waits for her is a nightmare of death and greed-and perhaps her final adventure . Paperback. Very good. Includes four quarto volumes related to Yellowstone-area science: Yellowstone Fisheries & Aquatic Sciences (National Park Service, 2007); Integrating Management Strategies for the Mountain Pine Beetle with Multiple-Resource Management of Lodgepole Pine Forests (U.S. Forest Service, 1985); Yellowstone's Northern Range: Complexity & Change in a Wildland Ecosystem (National Park Service, 1997); and Questioning Greater Yellowstone's Future: Climate, Land Use and Invasive Species (Yellowstone Center for Resources, 2011). All have some degree of edge wear, with some material missing at tail of spine from Questioning Greater Yellowstone's Future. A very nice copy in very good condition. Clean and unmarked except for the previous owners name on the inside front wrap. Jackson, WY: Northern Rockies Conservation Cooperative, 1989. Paperback. Very good. Quarto (28 cm), pp. 153. Buff wraps with black text and illustration by Denise Casey. Numerous maps and charts throughout. Light wear to wraps and previous owner's name on front. Boston: New York Graphic Society, 1979. First edition. Cloth. Just about fine in a crisp, price-clipped but unworn dust jacket, the spine of which shows a hint if sun.. Oblong folio, uunpag. ; two-tone cloth. This copy has been signed by Adams on the half title. In addition, Adams has signed and dated (9/11/79) a loosely inserted ticket stub from John Szarkowski's MOMA lecture that was given during the contemporary exhibition "Ansel Adams and the West." New York: Oxford University Press, 2006. First Edition. Hardcover. Very good/Very good. Octavo (24 cm), 371. Signed and inscribed to former Montana Fish Wildlife and Parks biologist Thomas Lemke on half-title page: "Tom, thanks for the information and insights on the northern range that you have given me. They made an important contribution to this book." Green boards with gilt spine text. Light green jacket with collage of photos. Illustrated throughout with black and white photos, graphs and charts. Spine tilt, else fine. Light rubbing to jacket and 1/2" closed tear at top near front flap. New York: G. P. Putnam's Sons, 1921. First Edition. (xiii)347 pages. First Edition. Illustrated from photographs and drawings. Folding map of Yosemite. Index. Appendices. SIGNED/INSCRIBED by Ansel F. Hall in ink on a front free endpaper,"With the sincere good wishes of Ansel F. Hall / Yosemite Valley, July 1923". Original green illustrated cloth. 4 3/4" x 7 1/2". The definitve guide to Yosemite, including history, ethnology, botany, geology, camp and trail craft, natural history and more; each section authored by an acknowledged expert in the particular field. Hall spent most of his adult life in Yosemite, as chief naturalist and in charge of Yosemite information. Some rubbing from handling; rear hinge open but holding; overall Very Good Plus or better, now in a custom, clear mylar protective jacket. Softcover. 88 pp. Yellowstone Publications, Montana (1962). First Edition. First Printing. Clean, bright, unmarked copy. Minor creases on front cars. Light scratches on pictorial rear card. No reader's creases to spine. Small price sticker on front card. Very Good+ to Near Fine. More photos on request. Shipped in a box within a box, in bubble wrap, with a tracking number. Boston, MA: New York Graphic Society. Hardcover. 1979. 1st Edition. Very Good+ in Very Good+ DJ. Oblong Folio. B&W Photographs. 28 p,  leaves of plates : 116 ill. Top protruding cover edges show some fading of blue color. Front edges lightly foxed. DJ bottom front corner slightly wrinkled . 1982. Old Sacremento State Historic Park by Ken Burke and Bob Burke, Burke & McKowen Enterprises, 1982, paperback, 20 pages, very good condition, illustrated with photos. El Portal, CA: Yosemite Association. As New. 2006. Limited/Numbered Edition; First Printing; Signed by Illustrator. Softcover. 1930238231 . A Numbered Special edition from The Yosemite Association in As New condition. This is the first time Dutch Courage has appeared as a separate publication. This finely printed edition is one of 350 copies signed by author Gerald Haslam (Introduction) and artist Larry Duke; Dutch Courage is the story of two men and their exciting experience climbing Half Dome, a granite dome in Yosemite National Park. It has appeared before now in collections of London's work; but never as a separate publication until this Limited Edition; Etching . Vancouver: UBCPress, 2011. hardcover. Fine Copy. Little Brown & Co (P). Very Good with No dust jacket as issued. 1992. Softcover. 082121523x . A book that looks almost new; 11.10 X 8.90 X 0.30 inches; 136 pages; Full of photos . Yellowstone National Park, WY: Yellowstone Center for Resources and George Wright Society, 2002. Paperback. Near fine. Octavo (23 cm), pp. 307. Gray pictorial wraps. Minor curling and creasing to wraps, else fine. Proceedings of the 2001 conference held at Mammoth Hot Springs Hotel, October 8 - 10. Includes 22 scholarly essays relating to various aspects of Yellowstone Lake. Missoula, Montana: Lawton Printing, 1960. Soft cover. Good. 8vo - over 7¾" - 9¾" tall. Colvert, Delynn . No Edition Or Printing Stated (Assumed First). The Cover Is Worn With A Hint Of Soiling. Chip At The Lowe Spine. Stapled Binding With Wrap. No Ownership Information Present And The Text Appears To Be Clean And Without Marks. New York: Baruch Katz, 1975. First printing. Paper wrappers. Slight rubbing else a fine copy.. Unpaged [6 pp. + 66 pp.]. Illus. with 63 b/w photos. Sm. 4to. Signed by one of the photographers, Carolee Campbell, an Emmy nominated actress who went on to become a printer of fine books and founder of Ninja Press. An exhibit catalog of a show at The American Museum of Natural History mounted to protect Riverside Park. Photos by Harvey Stein, Arnold Newman, Joel Meyerowitz, Arthur Tress, Bruce Davidson, and others. New York: G. P. Putnam's Sons. Near Fine. 1921. First Edition; First Printing. Cloth. A very Nearly Fine first edition copy, clean, straight, and tight with very slight rubbing of boards. Scarce as unsigned copy without inscriptions; Wonderful Americana collectible with classic 1920's illustrations. 17 articles by leading naturalists of the day, all covering various topics of Yosemite. Attractive moss green cloth hardcover stamped with vintage ivory and black pictorial scenes; 27 black and white photos, folding map . New York: G. P. Putnam, 1921. First Edition, First Printing. Hardcover. Very Good+/No Dust jacket. First Edition, decorated American trade binding. Green ribbed cloth boards with white title box and green, white and black mountain-forest-stream decoration on cover, black lettering and tree on spine. Very tiny spots of surface wear to spine ends, no fraying, no wear-through. Extremely light soiling to rear board (slight loss of sheen in one area). Decoration and lettering is crisp, no wear. Binding is tight and square, no cracking. Pages and edges are clean with blank endpapers - no names, writing or bookplates. Frontispiece illustration of Yosemite Valley with clean tissue guard; 27 additional full page illustrations (photographs). Fold-out map at rear of book in perfect condition. 347 pages with index.